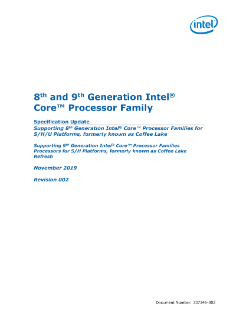 This spec update provides specification changes, errata, specification clarifications, and document changes to the 8th Generation Intel® Core™ processor family datasheet for the S/H/U-processor line. Delivering performance and value with rich media capabilities at an affordable price. Intel® Integrated I/O merges the I/O controller onto the processor for reduced latency. Provides searchable on-demand content and works on mobile devices throughout your home. Create rich, customizable firmware more easily than ever, and get your product to market faster. Stunning visuals and responsive performance for digital signage, retail kiosks, and thin clients. See the minicomputer in action with the speed and performance of Intel® Core™ processors.